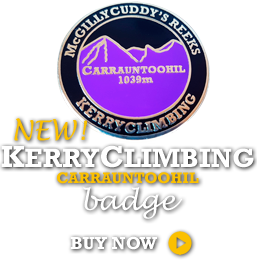 Weather conditions in the mountains of Ireland can and do change extremely rapidly especially in the Autumn, Winter and early Spring and conditions on the tops and the higher you climb will be hugely different to that in the valleys. 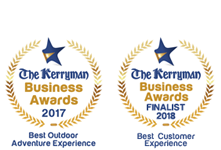 The following items are regarded as essential for high-level Winter hill walking, Mountaineering and Climbing in Ireland and it is vital that clients be fully prepared for and have the necessary gear to deal with the extreme and at times severe conditions experienced in the harsh Irish mountain environment. Your guide will carry a group shelter, basic first-aid kit, technical climbing gear, navigation equipment and provide any ropes if needed. Waterproof / windproof jacket and over trousers: Wet is the enemy of warmth, so decent waterproofs are essential to keep you dry. For Winter it is highly recommended that both tops and trousers are of a breathable fabric such as GoreTex or EVent or similar comparative fabric which allows breathability/venting and as a result allows sweat vapour to escape, otherwise you’ll have the potential of being wet from the “inside out” as condensation builds up on the inside. Make sure over trousers they have a full length or ¾ zip so you can get them on over your boots. Trousers: Make sure you choose trousers that are stretchy, comfortable and allow enough space to move your legs freely. It is advisable that they are not too thin and possibly contain a warm insulated layer. Denims are NOT acceptable, they dry very slowly once they get wet and in turn extract vital heat from the body. Insulation Layer : Since you will probably become inactive at some point during the day we may need to add another insulation layer to cope with the reduced heat output of the body at rest. This can be done by adding another mid layer under the shell layer, or by adding an insulating layer over the top of all the other layers. This latter approach is commonly called a belay jacket, since it’s often worn when static on a belay… Ideally, this layer will be very weight efficient, using down or a good synthetic down equivalent, so that it’s light and compact to carry, but adds a lot of insulation. It might usefully be water resistant, or even waterproof, depending on where and how you intend to use it. Boots: See detailed notes below. Head wear: Warm hat or beanie. Neck gaiters / ‘buffs’ can be also be useful. Consider sun protection/ lip balm as it is still possible to get burnt during Winter. Gloves: Gloves should be insulated, waterproof and long enough to cover wrists. It is advisable to take more than one pair as well as a thinner pair of liners. Consider mitts – they are warmer than gloves, but at the expense of dexterity. Gaiters: Gaiters provide protection from water and snow, add some insulation and guard against crampon snagging. Lunch and snacks: Bring enough but don’t over do it as remember, you have to carry it all! When packing your lunch it doesn’t have to be a slapdash effort, you deserve to feast well on slow releasing carbohydrates that replace the energy you use. It’s important to bring something you will really enjoy and can eat easily. A lightweight lunch box is recommended as it will help avoid your food getting squashed! Consider the temperatures and avoid chocolate goodies if it is warm as these will just melt, while chewy sweets can be a dental nightmare in cold conditions. A trail mix combination of nuts and dried fruit, is a great source of energy. There are in turn four categories of mountaineering boots: B0, B1, B2 and B3 with the higher the number relating to the amount of insulation as well as the stiffer the sole of the boot. Climbing over rock, scree, snow and ice demands an aggressive tread with deep lugs and solid, sharp edges which can cut stabilising steps into soft surfaces underfoot. These won’t be as flexible or as comfortable as your regular walking boots, but they will enable you to make ascents and descents with confidence. 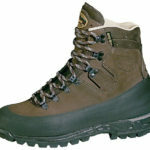 B0 boots are 3 season boots and are not designed for winter use. 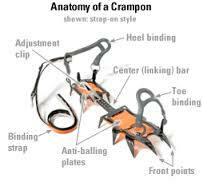 The sole is not stiff enough to prevent them moving differently to the crampon with the result that the crampons will move around and may come off altogether. They are also not very stiff in their upper section and may not provide enough support to your ankle or enough rigidity to allow ‘edging’ of the boot in snow when not using crampons. B3 technical boots are totally rigid, synthetic and sometimes even plastic and have the facility for heel clips and wire toe balls. 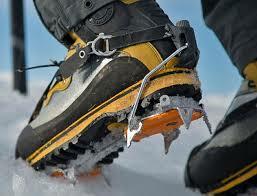 These are suitable for general walking, hard ice climbing, glacial terrain and high altitude mountaineering. Choosing the stiffness of a boot depends on the technical difficulty you are interested in pursuing. RIGID The most rigid boots, such as plastic, synthetic & extremely stiff leather boots, are most at home on technical ice routes. When your entire body weight is reliant on two front points shoved an inch into a flow of ice, your calves will appreciate the stiffness of a rigid boot. Hiking across boulders and along other rugged trails is, of course, possible in the most rigid boots, but takes some getting used to. You will have to learn how to heel-toe up to the technical bits. Not ideal, but the choice of many climbers. 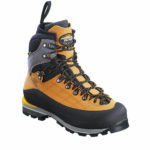 MEDIUM FLEX These boots are best for less demanding snow and ice routes. They will provide enough support for climbing cracks and lower-angle ice, while allowing for an increased degree of comfort. Both leather and synthetic boots work well in these situations, as long as the sole is firm and the upper provides support above the ankle. These boots can also be used on alpine rock climbs, where you’ll be jamming your foot into cracks. FLEXIBLE The most flexible boots are not suitable for snow and ice. There is a huge variety of ice-axes with different shapes and sizes. They can be divided into three broad categories – walking, mountaineering and technical. In general ice axes comprise of a shaft with a head at the top and a spike at the bottom. The head on most axes will have a pick at one end and an adze (small shovel or scoop) at the other. A walking ice axe is typically 55-75cm long, with a straight shaft and basic adze. These axes will have a ‘B’ (for basic) branded onto the adze or elsewhere. Better quality walking ice-axes may have a rubber grip on the lower shaft. Axes can come with a leash which when connected to the wrist avoids accidental dropping down a slope. Mountaineering axes are slightly shorter than general walking axes. Most have a straight shaft, though some do have a slight bend in the upper part of the shaft which aids swing when cutting steps in ice. The pick is more curved and the shaft is stronger than a walking ice-axe, therefore better suited for use with ropes and hooking. This type of axe may have a ‘T’ (for technical) branded onto the adze or elsewhere. 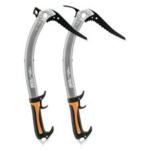 Technical ice axes, which may have curved shafts, are strong enough to be used for steep or ve rtical ice climbing and belaying. 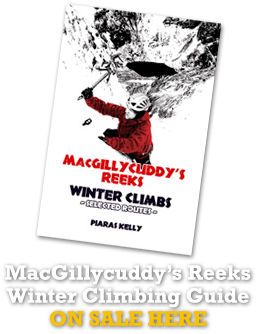 Specialized ice axes used for vertical ice climbing are known as ice tools. Ice tools have shorter and more curved shafts; stronger, sharper, and more curved picks which can usually be replaced, and ergonomic grips and finger rests. 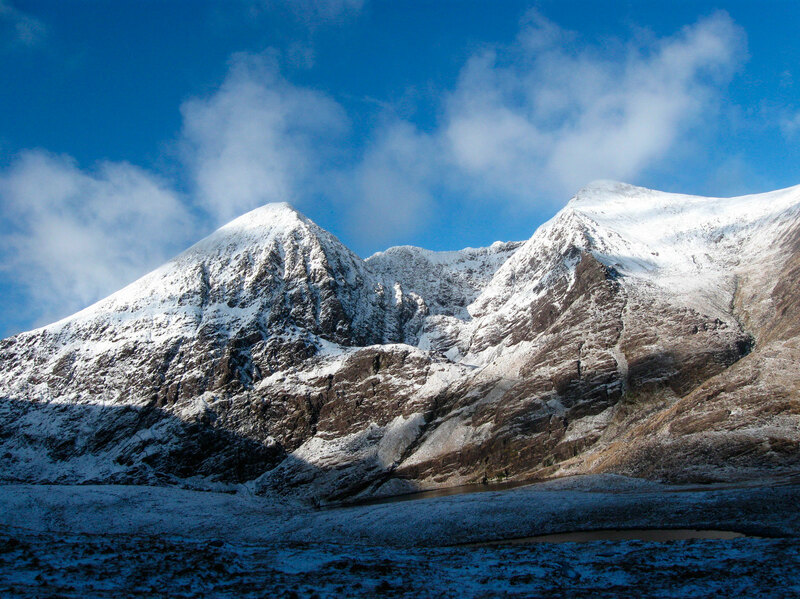 If you are Winter Hillwalking, Mountaineering or Climbing with us and don’t have the full complement of gear, we can help you out with some of the kit. 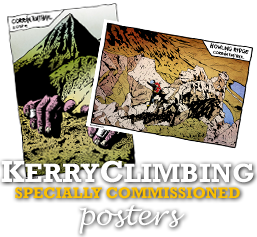 We can hire you C1 & C2 crampons as well as Walking and Mountaineering axes for €10 per item per day. Helmets & Harnesses’ if required are provided free of charge. We also have a limited number of sizes of boots. If you don’t have any of the above essential items in time for one of our events, no need to fret ! We can help with some of the gear, just give us a call and we will try our best to arrange to bring along spare if available. Please note that if you do turn up without the appropriate gear and haven’t arranged for us to bring spare, your guide may refuse to lead you on the hills.